Have you ever wondered on how to make the beet colored eggs which you got on your visit to a friends house? then its quiet easy. 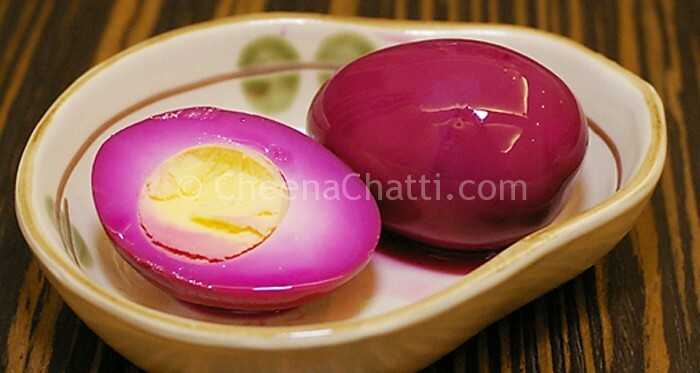 These pickled eggs are simply hard boiled eggs that are cured in vinegar. This is a really simple recipe and your kids get a kick out of the pinkish-purple eggs. Hard-boil the eggs (Add the eggs to cold water with 2 pinch salt and keep it on the stove until a rolling boil. Then turn off the flame & let sit in the same hot water for 15 minutes. Rinse the eggs in cold water and keep it in cold water until you are ready to use them or refrigerate) and peel them. In a big vessel, combine the sliced beetroots with vinegar and sugar. Boil it and keep stirring it until the sugar dissolves. Allow it cool down for a bit, but leave warm. Transfer the solution to a container and dip the eggs in it. Take the eggs out after 2 Days and rinse them shortly with cold water. Slice each of the eggs lengthwise and carefully remove the egg yolks. Mash the egg yolks with a fork and mix them with mayonnaise and mustard. Fill the egg yolks into the egg halves with a piping bag. Prolonged exposure to the pickling solution may result in a rubbery texture to the eggs. You can also try more egg recipes from our collection. Egg bread toast - How to prepare tasty evening snacks for your kids? This entry was added on April 29th, 2013 by Renoos in Condiments and tagged with quail egg pickle, cook egg pickle, non vegetarian, make egg pickle, pickles, egg pachadi, egg pickle, egg, pickled eggs recipe. Last revised on March 29th, 2018. Recipe & Recipe photo contributed by Sherly James. Never heard of such a dish..looks catchy..will try one day 🙂 Thanks for this blog!